The name Obadiah means “Servant of Yahweh.” Other than what he wrote scholars know nothing about him. Since the Bible mentions about nine Obadiah’s it’s best guess. According to Rabbinic tradition (and this one makes the most sense to me, and is quite interesting too), Obadiah is said to have been a convert to Judaism from Edom, a descendant of Eliphaz, the friend of Job. In the king lists for Edom in Genesis 36, Eliphaz was the firstborn son of Esau. Rabbinic tradition goes with the Obadiah who was the servant of Ahab, and it is said that he was chosen to prophesy against Edom because he himself was an Edomite. Moreover, having lived with two such godless persons as Ahab and Jezebel without learning to act as they did, he seemed the most suitable person to prophesy against Esau (Edom)…Obadiah is supposed to have received the gift of prophecy for having hidden the hundred prophets from the persecution of Jezebel. He hid the prophets in two caves, so that if those in one cave should be discovered those in the other might yet escape (1st Kings 18:3-4). This would place him as having lived around the reign of Ahab, Ahaziah and Joram of Israel (874-841BC), and Jehoram of Judah (848-841BC). It was also during Jehoram of Judah’s reign that Edom in the Mount Seir region and southern Judah (the Negev) rebelled against Judah, and stayed in rebellion. The Bible also mentions other Obadiah’s. See 1st Kings 18:3; 1st Chronicles 3:21; 1st Chronicles 7:3; 1st Chronicles 8:38; 1st Chronicles 9:16; 1st Chronicles 12:9; 1st Chronicles 27:19; 2nd Chronicles 17:7; 2nd Chronicles 34:12 and Nehemiah 8:9. But the short Book of Obadiah is more written about Edom’s future (cf. verse 15 “Day of the LORD, also cf. Joel 2:1-2), showing it is a prophecy about Edom in the end-time and so directly cross-references to Jeremiah 49:7-22 and Ezekiel 35:1-15. The identification of the Palestinians can be detected by a careful reading of Obadiah verse 19. But before we interpret verse 19 that way, let’s look at some pretty interesting historic evidence and attempt to trace the Edomites, as they conquered their way almost halfway across the globe. We’ll start at the beginning, with Esau, the founding father of the Edomites. This historic trail is kind of long, but it’s very interesting, and necessary to prove who Edom really is now in the Middle Eastern equation of end-time events which have been prophesied for Edom in Jeremiah 49:7-22, Ezekiel 35:1-15 and Obadiah verses 1-21. It’s time for some Biblical and secular history to be combined here to show just who Edom is in order to understand this prophecy in Obediah and how it applies. First realize that the Jewish people, the tribe of Judah (along with the half-tribe of Benjamin and Levi) were prophecied to return to Palestine in the “end-times.” Zephaniah 2:7, “The coast shall be for the remnant of the house of Judah; they shall feed their flocks there; in the houses of Ashkelon they shall lie down at evening. For the LORD their God will intervene for them, and return their captives.” These prophecies in Zephaniah 2 are all centering around the land of Palestine, the Promised Land, in the end-times. This short little prophecy shows Yahweh, the pre-incarnate Christ, has decreed that the Jews will return to the coast of Palestine from their captivity. What captivity did the Jews just suffer through before the State of Israel was founded in 1948? Duh, the Holocaust! And furthermore, whatever rest they have is due to the Divine intervention of Yahweh, now the Messiah, Jesus Christ, and yes, before he has called them to Salvation! But remember, the complete fulfillment of this prophecy occurs at the 2nd coming of Jesus Christ, when the Jews in Israel will be rescued and taken out of their captivity under the Euro forces and Edom. This captivity is yet to occur, and doesn’t occur until the Tribulation. But Edom plays a part in temporarily claiming Israeli land for themselves. So if you harbour anti-Semitic attitudes toward the Israelis, you’d better drop them fast. Read through this chapter to see that the context is all for the land of Palestine. God is using the House of Judah, the Israelis, to lead the way for the total Restoration of the 12-tribed nation of Israel. We’ll get back to this Jewish-Israeli restoration history as soon as we finish looking at this Biblical-secular history of who Edom is. Esau was Jacob’s twin brother, and there was real jealousy over the Abrahamic birthright between the two brothers, which was ultimately given to Jacob (whose name was changed to Israel). This whole history is covered from Genesis 25 through 36. In Genesis 33:16, we will see that peace has been restored between the two brothers, but over time the two families which come from them become two races of people (Genesis 35 through 36). Edom from Esau, as a nation living around the Petra area of southern Jordan attempted to block Israel’s first entrance into the Promised Land (Numbers 20:14-21; and 24:15-19). Ongoing conflicts with Israel and Judah occurred when Saul, Solomon, Jehoshaphat, Jehoram and Ahaz were kings (see 1st Samuel 14:47; 1st Kings 11:14-22; 2nd Chronicles 20:1-25; 2nd Kings 8:21). The prophets of God regularly referred to this age-old jealousy between the children of Esau and Jacob, now Edom and Israel (see Isaiah 11:11-16; Daniel 11:41; Amos 2:1; Malachi 1:2-5). Take the time to read those Scripture passages to get an idea of how God feels about Edom, the children of Esau. In this study today, I will attempt to show you from secular history why God feels that way, it is because of the way Edom is. Genesis 27:1-29, “Now it came to pass, when Isaac was old and his eyes were so dim that he could not see, that he called Esau his older son and said to him, ‘My son.’ And he answered him, ‘Here I am.’ Then he said, ‘Behold now, I am old. I do not know the day of my death. Now therefore, please take your weapons, your quiver and your bow, and go out to the field and hunt game for me. And make me savory food, such as I love, and bring it to me that I may eat, that my soul may bless you before I die.’ Now Rebekah was listening when Isaac spoke to Esau his son. And Esau went to the field to hunt game and to bring it. So Rebekah spoke to Jacob her son, saying, ‘Indeed I heard your father speak to Esau your brother, saying, Bring me game and make savory food for me, that I may eat it and bless you in the presence of the LORD before my death. Now therefore, my son, obey my voice according to what I command you. Go now to the flock and bring me from there two choice kids of the goats, and I will make savory food from them for your father, such as he loves. Then you shall take it to your father, that he may eat it, and that he may bless you before his death.’ And Jacob said to Rebekah his mother, ‘Look, Esau my brother is a hairy man, and I am a smooth-skinned man. Perhaps my father will feel me, and I shall seem to be a deceiver to him; and I shall bring a curse on myself and not a blessing.’ But his mother said to him, ‘Let your curse be on me, my son; only obey my voice, and go, get them for me.’ And he went and got them and brought them to his mother, and his mother made savory food, such as his father loved. Then Rebekah took the choice clothes of her elder son Esau, which were with her in the house, and put them on Jacob her younger son. And she put the skins of the kids of the goats on his hands and on the smooth part of his neck. Then she gave the savory food and the bread, which she had prepared, into the hand of her son Jacob. So he went to his father and said, ‘My father.’ And he said, ‘Here I am. Who are you, my son?’ Jacob said to his father, ‘I am Esau your firstborn; I have done just as you told me; please arise, sit and eat of my game, that your soul may bless me.’ But Isaac said to his son, ‘How is it that you have found it so quickly, my son?’ And he said, ‘Because the LORD your God brought it to me.’ Isaac said to Jacob, ‘Please come near, that I may feel you, my son, whether you are really my son Esau or not.’ So Jacob went near to Isaac his father, and he felt him and said, ‘The voice is Jacob’s voice, but the hands are the hands of Esau.’ And he did not recognize him, because his hands were hairy like his brother Esau’s hands; so he blessed him. Then he said, ‘Are you really my son Esau?’ He said, “I am.’ He said, ‘Bring it near to me, and I will eat of my son’s game, so that my soul may bless you.’ So he brought it near him, and he ate; and he brought him wine, and he drank. Then his father Isaac said to him, ‘Come near now and kiss me, my son.’ And he came near and kissed him; and he smelled the smell of his clothing, and blessed him and said: ‘Surely, the smell of my son is like the smell of a field which the LORD has blessed. Therefore may God give you of the dew of heaven, of the fatness of the earth, and plenty of grain and wine. Let peoples serve you, and nations bow down to you. Be master over your brethren, and let your mother’s sons bow down to you. Cursed be everyone who curses you, and blessed be those who bless you!’” We just read here in this set of Scriptures that Jacob, at his mother’s urging and coaching, stole his brother Esau’s birthright. The birthright going to the eldest son in the Middle East was a serious thing, not taken lightly, although we saw previously, Esau had taken it lightly (Genesis 25:29-34). Now notice something in these Scriptures, the birthright Isaac bestows on each young man suits the personality of the man. Who was the Promised Land Bequeathed To? Now notice whom Esau marries, one of his wives is the daughter of Ishmael, whom the Arabic race comes from. Let’s take a good look at who Esau married, and who his children were and became. Genesis 28:6-9, “Esau saw that Isaac had blessed Jacob and sent him away to Padan Aram to take himself a wife from there, and that as he blessed him he gave him charge, saying, ‘You shall not take a wife from the daughters of Canaan,’ and that Jacob had obeyed his father and his mother and had gone to Padan Aram. Also Esau saw the daughters of Canaan did not please his father Isaac. [So understand at this point, Esau is married to two daughters of Canaanite origin.] So Esau went to Ishmael and took Mahalath the daughter of Ishmael, Abraham’s son, the sister of Nebajoth, to be his wife in addition to his wives he had.” Can you imagine the tremendous hostility and jealousy that was between Esau and Jacob at this point in time? Jacob, understandably, has to flee for his life. Then from Genesis chapters 29-31 Jacob marries his uncle Laban’s two daughters and has 12 sons and one daughter through them, from which quite a clan will sprang up, becoming the nation of Israel, and then even an assembly of nations. Then Jacob is forced to flee from uncle Laban and his sons and return to the land of Canaan and his father Isaac. Here we find something interesting. Esau comes to meet Jacob and his large family as they are returning home to Isaac. Naturally, Jacob is scared to death of this coming encounter with his brother Esau. But take careful note of what Esau has become, the leader of a band of four-hundred men who are apparently on horseback, traveling swiftly toward him and his family. Esau is also now living in the Mount Seir region, the region which was later to be called Edom as his family expanded to become a race called Edomites. This region is at or near Petra in southwest Jordan, bordering on the Negev desert. [See http://en.wikipedia.org/wiki/Edom] Genesis 32:3-7, “Then Jacob sent messengers before him to Esau his brother in the land of Seir, the country of Edom. And he commanded them, saying, ‘Speak thus to my lord Esau, Thus your servant Jacob says: I have dwelt with Laban and stayed there until now. I have oxen, donkeys, flocks, and male and female servants; and I have sent to tell my lord, that I may find favor in your sight.’ Then the messengers returned to Jacob, saying, ‘We came to your brother Esau, and he also is coming to meet you, and four hundred men are with him.’ So Jacob was greatly afraid and distressed; and he divided the people that were with him, and the flocks and herds and camels, into two companies. And he said, ‘If Esau comes to one company and attacks it, then the other company which is left will escape.’” Genesis 33:1, 4-9, 12-14, 16, “Now Jacob lifted his eyes and looked, and there, Esau was coming, and with him were four hundred men…But Esau ran to meet him, and embraced him, and fell on his neck and kissed him, and they wept. And he lifted up his eyes and saw the women and children, and said, ‘Who are these with you?’ so he said, ‘The children whom God has graciously given your servant.’ Then the maidservants came near, they and their children, and bowed down. And Leah also came near with her children and bowed down. Afterward Joseph and Rachel came near, and they bowed down. Then Esau said, ‘What do you mean by all this company which I met?’ And he said, ‘These are to find favor in the sight of my lord.’ But Esau said, ‘I have enough, my brother; keep what you have for yourself.’…Then Esau said, ‘Let us take our journey; let us go, and I will go before you.’ But Jacob said to him, ‘My lord knows that the children are weak, and the flocks and herds which are nursing are with me. And if the men should drive them hard one day, all the flock will die. Please let my lord go on ahead before his servant. I will lead on slowly at a pace which the livestock that go before me, and the children, are able to endure, until I come to my lord in Seir…So Esau returned that day on his way to Seir.” Driving the flocks hard here would strongly imply Esau and his band of 400 men were on horseback, most definitely not on foot. Esau was now leading a band of men, 400 of them, and by the context here, he and they were on horseback, traveling fast to meet up with Jacob and his returning family. Let’s take a look at the descendants of Esau. Genesis 36:1-14, “Now this is the genealogy of Esau, who is Edom. Esau took his wives from the daughters of Canaan: Adah the daughter of Elon the Hittite; Aholibamah the daughter of Anah, the daughter of Zibeon the Hivite; and Basemath, Ishmael’s daughter, sister of Nebajoth. Now Adah bore Eliphaz to Esau [his firstborn], and Basemath bore Reuel. And Aholibamah bore Jeush, Jaalam, and Korah. These were the sons of Esau who were born to him in the land of Canaan. Then Esau took his wives, his sons, his daughters, and all the persons of his household, his cattle and all his animals, and all his goods which he had gained in the land of Canaan, and went to a country away from the presence of his brother Jacob. For their possessions were too great for them to dwell together, and the land where they were strangers could not support them because of their livestock. So Esau dwelt in Mount Seir. Esau is Edom. And this is the genealogy of Esau the father of the Edomites in Mount Seir. These were the names of Esau’s sons: Eliphaz the son of Adah the wife of Esau, and Reuel the son of Basemath the wife of Esau. And the sons of Eliphaz were Teman, Omar, Zephon, Gatam, and Kenaz. Now Timna was the concubine of Eliphaz, Esau’s son, and she bore Amalek to Eliphaz. These were the sons of Adah [the Hittite], Esau’s wife. These were the sons of Reuel: Nahath, Zerah, Shamamah, and Mizzah. These were the sons of Basemath Esau’s wife [Ishmael’s daughter]. These were the sons of Aholibamah, Esau’s wife, the daughter of Anah, the daughter of Zibeon [the Hivite]. And she bore to Esau: Jeush, Jaalam, and Korah.” He married a Hittite woman (the Hittite empire was in Asia Minor at this point in time, all the way up through the time of the Exodus. The Mitanni warriors may have been Hittites). He had three wives, a Hittite, a Hivite and an Ishmaelite. The Ishmaelite wife was an attempt to please Isaac and Rebekah. As we go on we’ll just see the hostile family dynamics working here. Notice Amalek, the father of the Amalekites and great enemy of Israel was Esau’s grandson. I can just imagine where Amalek got his intense hatred for the sons of Jacob, as he sat on his grandfather Esau’s knee listening to him recount what happened to him in Genesis 27:30-41. Genesis 36:31-39, “Now these were the kings who reigned in the land of Edom before any king reigned over the children of Israel: Bela the son of Beor reigned in Edom, and the name of his city was Dinhabah. And when Bela died, Jobab the son of Zerah of Bozrah reigned in his place. When Jobab died, Husham of the land of the temanites reigned in his place. And when Husham died, Hadad the son of Bedad, who attacked Midian in the field of Moab, reigned in his place. And the name of his city Avith. When Hadad died, Samlah of Masrekah reigned in his place. And when Samlah died, Saul of Rehoboth-by-the-River reigned in his place. When Saul died, Baal-Hanan the son of Achbor reigned in his place. And when Baal-Hanan son of Achbor died, Hadar reigned in his place; and the name of his city was Pau. His wife’s name was Mehetabel, the daughter of Matred, the daughter of Mezahab.” This brings us to the beginning of our secular historic trail. Two names stand out here in the king list, Husham and the grand-daughter of another king whose name was Mezahab (Me Zahab). Why? Because they are found on the ancient list of kings for ancient Persia [Persia and the Elamites before Cyrus]. From here on out we’re going to walk through secular history to trace where the Edomites traveled to in a swath of conquering destruction on horseback. Now that king list we just read gives us the foundation from which we will be able to trace the race which descended from Esau, which conquered halfway across the globe at various times in history. This is the history of the Turkic people, as well as a branch called the Idumeans, which tended to stay around Edom and Judea in the times of the kings of Judah and Judea under the Maccabees. We will trace through all of this to the best of my ability and others who have sleuthed this out, taking us right up to now with the Israeli-Palestinian problems of today. Teman the son of Eliphaz was a grandson of Esau and his wife Adah the Hittite. The region of Persia and Turkestan became known as the “land of Temani” after Teman. One of the kings of Temani was Husham, who is also called, as well see, king Hushan or Hushang in the ancient Persian king list. His native land was in ancient Persia, showing that the Edomites were already migrating out of their ancient land of Edom in what is now southwestern Jordan and the Negev region of Israel. Archeological studies in pottery connect this Sialk culture to Turkestan. One of Husham’s descendants was Alphidun. Alphidun had two sons, Tur, who ruled the Edomites of Central Asia (thought to have given the various names of Turkestan, Turk, and Turanian. So we see the Edomites named the rocky Persian and Turkestan plateaus the “land of Temani.” As we study what historians have discovered, we’ll trace the Turkic peoples to the Oghuz or Uighurs who came out of Central Asia and Turkestan into Asia Minor in the 11th century AD. Their tribal ancestors (the Ertoghrul) carved out the Seljuk and Ottoman empires. Some historians think the name Teman has been carried over into the Ottoman empire in the phrase “O Teman, or O-Thman in Obediah verse 9, which equals Ottoman. Now lets try to prove some of this out. 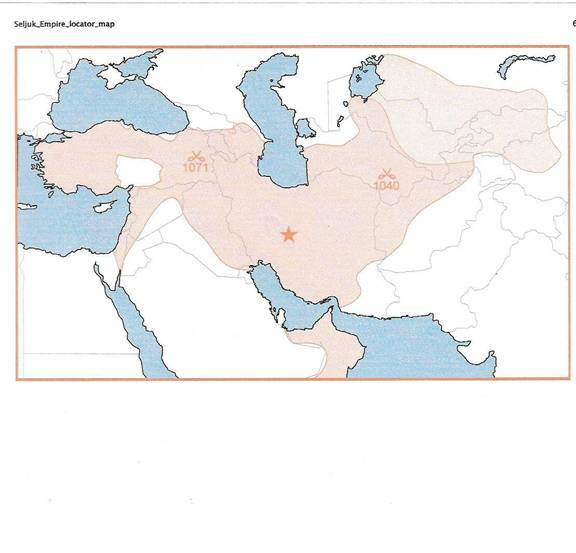 From Dr. Herman Hoeh, late historian of the Worldwide Church of God we get an excellent skeletal outline of Edomite history, conclusively connecting the Turkic peoples to Edom. 7. Alphidun---1361-1241BC [probably 1321-1201BC]---The new king lived 123 years. He married the daughter of Dahak. He divided his realm between his sons. To Tur he gave Turkestan. To Irege, son of a Persian woman, the realm of Persia was assigned. From Tur the Temanite inhabitants of Turkestan took the name Turan or Turk. In the family quarrels which followed, all the sons of Alphidun were slain, and the kingship passed to Manougeher, son of Irege. 10. Apherasiab---1114-1102BC [again, subtract 40 years] He was a great Khan of Turkestan, a descendant of Tur, and joined Persia with Tartary. Constant rebellion led at length to the establishment of a descendant of Kajomaras on the Persian throne. 11. Zaab or Bazab---1102-1072BC [again, subtract 40 years] Who was this Zaab? Turn to Genesis 36:39. Hadar, king of Edom, married “Mehetabel, the daughter of Matred, the daughter of Me-zehab” (“Jewish Publ. Soc.”). (Mezahab is the KJV spelling.) Bazab is but an altered and shortened spelling of the Hebrew Me-zahab…Hadar is the last king of Edom who began to reign before Saul. The chronology of Persia is in perfect harmony with the Biblical account. Here again is proof that the Bible is the foundation of knowledge. Without the list of rulers of Edom in Genesis 36, it would not be possible to understand fully who the early rulers of Persia were. 12. Gustasp or Kischtasp---1072-1042BC [again, subtract 40 years]…The reign of Gustasp was put to an end by struggles with Apherasiab of Turkestan. In this time of national struggle, and heir of the line of Nodar and Zaab established Persian independence from the Turks and founded the Dynasty of the Kaianites or the “second race” of Persian historians. Turkic weapons, archery on horseback, isn’t that a trait of Esau? John Lawton continues, “The founder of Turkic power was a wily politician named Bumin, who bore the title of khagan, or ruler. How he became leader of the Altey Turks is not known. But having forged an alliance with the Western Wei dynasty of China, Bumin deliberately provoked the Jaun-juan into a war by demanding one of their princesses in marriage. Aided by Chinese forces, the Turks routed the Jaun-juan in 552 and then subjugated neighboring nomadic tribes to become uncontested master of the Mongolian steppe. Mounted bowmen were the formidable and very mobile force of the Turkic armies. The middle of the first millennium [AD] saw the first widespread use of the rigid saddle with stirrups. Accurate shooting on the run became possible for the first time when a rider could stand up in his stirrups, absorbing with his bent knees the jounce of this galloping steed. All later types of saddle can be traced to the ancient Turkic type, while archery---of which we witnessed several massive displays in Mongolia---remains after riding and wrestling, one of the most popular sports of the steppe. Bumin dies soon after his victory and his domains were split into two parts. The eastern part, which had the primacy if not the supremacy of the two halves, was ruled by his son Mu han (553-572 [AD]) and the western part by Bumin’s brother Ishtemi (553-573)---both aggressive expansionists. Mu-han conquered the Khitans in the east and seized the north Chinese kingdoms. In the West, Ishtemi expanded his territory as far as the rivers Ili and Chu and brought Turkic rule to the frontiers of the Hephtalite empire of Central Asia...The Turks were the first steppe people to realize the importance of trade. They offered security to caravans and concluded treaties with the Sassanids and Byzantines, protecting commerce along the Silk Roads---the network of caravan trails which linked East and West across Central Asia (See Aramco World, July-August 1988).” [ibid. p. 7, par. 7-9, p. 3, par. 3] From here we trace the movement of Turkic power and influence moving back west into the Middle East and Turkey itself as the Ottoman Empire is established. This historic link comes through the conquering Seljuqs. Back to John Lawton’s article: “The Uighur rising marked the end of unity among the Turkic tribes of Central Asia. From that point on, the larger tribal coalitions either created kingdoms of their own in Central Asia or migrated to the Russian steppe and the Middle East. [emphasis mine] The collapse of the Turkic empire marked the beginning of a long period of instability on the steppe that did not end until the rise of the Mongol Empire in the 12th century. The principal Turkic states created in Central Asia during this period were those of the Qarakhanids, the Khwarizm-Shahs and the Seljuqs. All abandoned the nomadic life and adopted Islam. Even today, the Turks’ most important cultural link, along with history and language, is Islam. With the exception of he Yakut of eastern Siberia and the Chuvash of the Volga region of Russia, the Turks are all Muslim…Meanwhile, on the western flank of Islam, the Seljuq Turks scored a landmark victory over the Byzantines at Malazgirt in 1071 [AD] confirming their occupation of the grasslands of Anatolia. Thus, modern Turkey became Turkish for the first time. Which brings us geographically full-circle, and to the conclusion that the various similarities that exist among the various Turkic peoples today go back to the Altey Turks---whose weathered stone statues still stand vigil over the land of their origin in the Mongolian mountains and steppes.” [ibid. p. 6, par. 2-4, 7-8] From here we will take a closer look at the Seljuq Turks, who swept back into the Middle East and what is now Turkey. One branch of Esau and Edom are returning home to the Middle East, historically, through the Seljuqs, as we’ll see. The Seljuqs brought the Turkic race back into the Middle East, and control of it, from modern day Turkey down the coast all the way through Syria, Lebanon and Israel, all of Iran and half of Iraq. The Seljuq empire lasted from 1071AD to about 1325AD, until it was supplanted by the Ghazhi’s under Osman I, starting the Ottoman Empire, which we will look at next. But don’t forget, conquering Seljuq Turks, and then conquering Ottoman Turks bring the Turkic race of people, armies and whatnot into the lands of ancient Israel, Palestine. Where armies are (and I’m painting this with a wide brush historically) people settle down, marry, have families and to some degree became part of the indigenous race living in the land. Seljuq Turks were in control of the land that is modern day Israel now. Then, as we’ll see, Ottoman Turks were in control of the land that is modern day Israel now.